This is hardly an obscure little film as far as I'm concerned, but I'm still amazed and flabbergasted at the number of people I encounter who have never heard of, let alone seen The Fifth Element, Luc Besson's 1997 visually energetic sci-fi outing. And that's through no fault of Columbia TriStar, who have released a short stack of DVD versions over the years, including this latest iteration, the two-disc "Ultimate Edition." It's certainly a difficult proposition to improve on the audio and image quality of the Superbit version, and though this one doesn't officially bear the SB brand, it is every bit as flawlessly vivid in the sound and vision departments, and the film, well that's basically perfect already. 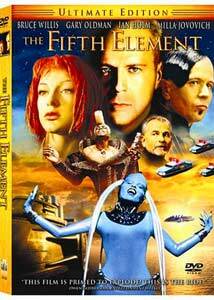 Besson, who did edgy, somber and violent so well in Léon and La Femme Nikita, snapped on a completely different head for The Fifth Element—an explosively fun, colorful, and effects-rich futuristic tale of impending evil about to destroy 23rd-century Earth. Mankind's only hope is Korben Dallas (Bruce Willis), a cocky former Federation specialist-turned-cab driver who has to help a prophesized "perfect being" name Leeloo (Milla Jovovich) stay alive long enough to fulfill her destiny. There are strange alien races doing battle against one another, a manic New York city filled with thousands of zooming flying cars, a blue-skinned diva with a secret stash, Gary Oldman adopting a southern twang as the ruthlessly over-the-top villain Jean-Baptiste Emanuel Zorg and Milla Jovovich spending an inordinate amount of time wandering around in strategically-placed thermal bandages. The visual effects are impressive and plentiful, but the script melds comedy, adventure, action and sci-fi into a big ball, and it is the way Besson glides back and forth between the various genres that gives The Fifth Element a refreshingly distinctive sheen. And that's where the real pleasure lies, in the way Besson has made such a tangible futuristic world—with all of the de rigueur weapons, villains and set pieces—but coats the storytelling with enough light humor (Leeloo's mangled English) and nonsensical jokes (such as Zorg choking on a cherry pit) to play against the norm. As if to reinforce the point that this isn't mean to be too brooding, the second half features a near overdose of Chris Tucker's slightly grating DJ Ruby Rhod, a character so purely flamboyantly manic that he will either make you laugh or cringe uncontrollably, but either way so jarringly weird that it screams this is not to be taken as dreadfully serious. There is a lot of potential excess here, but Besson really keeps a tight reign on the way the visuals come across. He doesn't rub our noses in the money shots too often, except when it's justified, such as that dizzying New York city sequence, complete with Leeloo's ledge leap, for example. Instead, he allows the visual effects to slide in almost unnoticed at times, and they're sometimes presented with such a casual grace that the fabric and design of the 23rd century suddenly seems genuine, because the characters all seem so comfortable in it. This is in contrast to the big, colorful and noisy action sequences that explode out of these ordinary futuristic moments, propelling The Fifth Element onto a high plateau of its own. This one just gets better every time I see it. Image Transfer Review: I'll avoid dipping into my thesaurus too much to drool about the lifelike transfer on this 2.35:1 anamorphic widescreen, but suffice to say this is about as perfect as the format can get. The level of detail, the vivid colors, the rich blacks get showcased as good as the previous Superbit release, and there is really nothing at all to complain about here. No compression problems, no artifacts, no smearing. It is just beautiful. This is a reference quality transfer of the highest order, and is simply stunning to look at. Audio Transfer Review: Like the image transfer, the audio side of this release more than holds its own. Listening choices are either Dolby Digital 5.1 or DTS, and both mixes are wildly aggressive presentations, offering equally strong dramatic levels of sonic punch and clarity. There is quite a bit of directional movement on both tracks, whether it be ships zooming from rear right to front left, or weapons firing across all channels, and though I always seem to prefer DTS, neither option can remotely be considered substandard. Extras Review: This new two-disc set comes housed in a double amaray case with thick stock slipcover; it's a nice presentation, even if it relies on the overused "floating heads" style of artwork. Disc 1 contains the film, as well as a text-based commentary/trivia track of sorts called Fast Track (available in either English or Spanish). This is essentially a collection of unrelated random facts about the production that pop up here and there, and while I enjoyed most of these assorted nuggets of knowledge, it was the readability of the font I had the biggest problem with. And just so you don't think it's my aging eyeballs, my 13-year-old daughter Sammie voiced the same concern. So there. The main segment is a featurette (18m:24s) discussing the initial design of the look of Besson's world, with the help of reknowned artist/designers Jean Claude Mezieres and Jean (Moebius) Girad. There are brief discussions of the development of the creature looks, as well as a few alternate test drawings for The Diva. There are also seven short bits of test footage for the Pyramid, Cornelius' Apartment, Zorg's Office, Airport, Fhloston Lobby, Fhloston Corridor, and the Fhloston Bedroom sequences. This element has just one segment (09m:47s), and centers on Digital Domain, the visual effects house used to create all the stunning effects shots, such as the congested airspace of the New York City sequence. There are plenty of green screen production clips, including Mila's big leap from the ledge, and the creation of some incredibly detailed miniature model buildings. No this isn't about Star Jones, but instead this element looks at the three big leads: Bruce Willis (04m:18s), Milla Jovovich (12m:47s), and Chris Tucker (04m:17s). A bit on the fluffy side, but Jovovich's segment includes a quartet of eye-pealing screen test clips. Want to see how the main alien creatures were designed, including one not used in the final cut? Step right up. They're a little brief, but the shuffling Mondoshawans (08m:12s), villainous Mangalores (09m:46s), Zorg's pet Picasso (04m:16s), and the eventually cut garbage dwelling Strikers (03m:04s) all get a quick once over. It's all about style in this featurette (07m:46s), featuring fashion guru Jean-Paul Gaultier, who designed all the hip getups in The Fifth Element. Jean-Paul chats up his motivations for his approach to the 23rd century, and we get a peek at some of the original design drawings, too. There are also clothing test for Korben and Leeloo. The Diva (16m:16s) was probably my favorite of the bunch, and features an interview with Besson's onetime galpal Maïwenn, who played the film's highly memorable blue-skinned operatic crooner. Maïwenn, in her wonderfully fractured English, provides a buildup to how she eventually took the role, and her concerns about how her scene was eventually edited in such a way that no one would really get a chance to see her character. Little did she know how iconic the Diva character would be for The Fifth Element, and as a nice payoff there is also her full, unedited scene (performed in front of a green screen), along with a makeup test and a couple of test footage clips. The Poster Gallery has 25 example of international promotional material for the film. Disc 1 is cut into 28 chapters, and features optional subtitles in English, French, Spanish, Portuguese, Chinese or Thai. This probably isn't news to you, and by now you should now that The Fifth Element is a joyously inventive sci-fi flick not afraid to go for a laugh when needed, and one filled with a rare kind of visual grandeur. Yes, this represents the umpteenth visit to the DVD buying well for this title, and though it's difficult to imagine topping the Superbit in terms of sheer image quality, this UE has an equally brilliant transfer, plus it tacks on a second disc loaded with nearly two hours worth of extras. If you already own the Superbit, you may want to rent just to peruse the supplements, otherwise take the plunge on the UE and get the best of both worlds.